While visiting Madurai and the surrounding area, it is easy to catch the early morning train for Ramesvaram. It is a relaxing ride (about six hours) as we head toward the coast. The first time I went there, it was a pleasant train ride all the way there, but the second time several years later everyone had to jump off and change trains about half-way there. Ramesvaram is a tropical island surrounded by coral reefs and sandy beaches with coconut palms and tamarind trees. It is a major holy place of pilgrimage for both Vaishnavas and Shaivites. One of the major reasons for its importance is its connection with Lord Rama and the Ramayana, and its vicinity and link to Sri Lanka, which plays a major role in some of the sites that we will see here. When we arrive at the train station, it is not unlikely to be greeted by a guide who wants your business. Actually, the first time I visited Ramesvaram I stayed for three days and saw everything on my own, taking mostly buses instead of rickshas, etc. But the second time I visited I took a guide and actually with his help I did more in one day than I did during the previous visit in three days. So, it all depends on how you want to do things. In this tour, I will describe the more important places to see. In the central part of town is the Sri Ramanathaswamy temple, which is one of the most important in India. 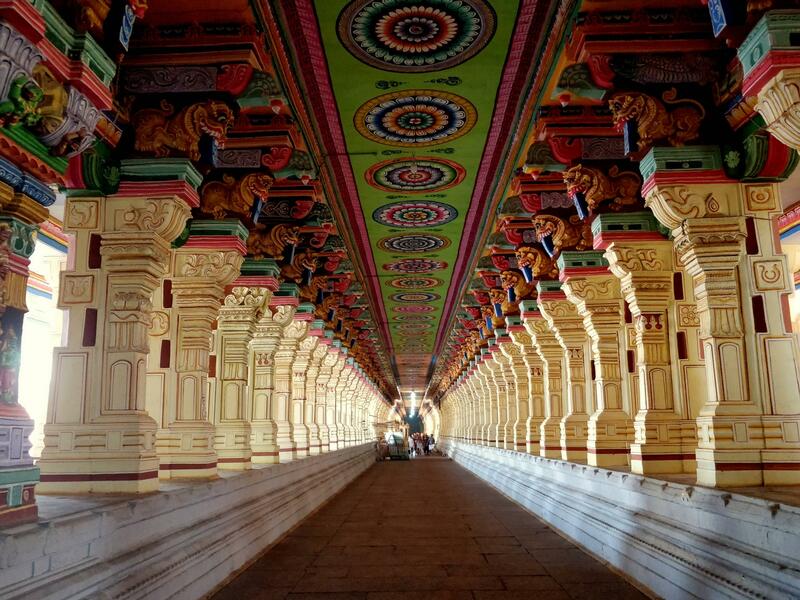 It is a massive complex with a number of shrines, holy wells, gopurams, and several long hallways, one reaching 4000 feet in length, the longest in the country. The halls are adorned with many large pillars, some of which are covered with scroll work, lotus designs, animals, and other figures, and colorful painted medallions are on the ceilings. According to legends, this temple was originally started by Lord Rama. Lord Rama had gone to Sri Lanka to rescue His wife, Sita, and engaged in a great battle during which He killed the demon Ravana. Afterward, He wanted to absolve Himself of the sin by installing a lingam at Ramesvaram. He sent His most trustworthy servant Hanuman to get a Shiva lingam from Mount Kailash, but Hanuman was delayed in his return. Since Shiva had to be worshiped by a certain time, Sita made a lingam (Sri Ramanatha) out of sand. When Hanuman returned with a linga, he was disappointed and angry to find another linga already installed. To pacify Hanuman, Rama had the Hanumath lingam (Visvalingam) installed next to the Ramanatha lingam. Then He ordered that all worship should first go to the Visvalingam. So, in this complex the main shrines are for Visvalingam and the Sri Ramanatha lingam. It is now the seat of one of the 12 jyotirlingas (self-manifesting lingas). The Ramesvaram temple is also where Sri Chaitanya Mahaprabhu found the Kurma Purana. Within it He found a verse stating that Ravana kidnapped an illusory Sita, and the real Sita was safely hidden by Agni. This information has greatly relieved many devotees of Sri Sri Sita-Rama. A pilgrimage to this temple begins with a holy dip in the waters of the ocean at Agni Thirtam, which is just on the east side of the temple. It is actually quite beautiful here, and you will see many sadhus who stay in the nearby ashramas, or who are begging for their maintenance from the pilgrims who are visiting. After that we go to the main temple wearing devotional clothes like dhoti and kurta, and with the help of a temple assistant we go to take a holy bath in the 22 spring-fed wells within the temple complex. The temple is quite beautiful, and I loved wandering through the halls. It takes a little while to get to know your way around since it is quite large. Anyway, with the help of an assistant, he shows us where each well is and the order in which to visit each one. Then he drops a bucket into the water and pulls it up by the rope and pours the water over you, or at least over your feet and some on your head if you don’t want to take a full bath. Some of the wells are right next to each other, but the water from each is different, some sweet while others may be more salty. Each well has a certain significance and offers particular blessings, and each bath purifies and frees us from so much karma. So, as we make our way around the temple, bathing in the wells, we are purified of lifetimes of karma and become purified enough to enter the inner sanctum and make an offering to the main deity. When we reach the main sanctum after all the holy baths, our guide gives us a bag full of puja items, and we later give it to the priest when it is our turn. These include incense, a flower garland, coconut, incense, etc. We first get in line for darshan of the Ramanath lingam. There is a special darshan line for 50 rupees (probably more now) that goes much quicker. When our turn comes, we are called forward and sit on the steps at the entrance to the sanctum and give our offering to the priest. These are offered and you can see the priest put the garland over the linga. Then after offering flowers and the other items, he brings some back for you as prasada. If no offering was provided for the priest, we still get to watch his prayers and puja, and he brings back the flame for us to touch and sacred ash to accept. Then we move on to the Hanuman lingam (Visvalingam) which Hanuman had brought for Rama and Sita to use but was a little late. Then we circle around to the shrine for Parvati (Parvathavardhani), the companion of Shiva, where we get in line to have darshan of her image while the priest does a puja for us. The deity is a little distance away from us and lit by ghee lamps, so the finer details are a little difficult to see. There’s also a separate shrine to Lord Vishnu with a deity made of white marble, known as Sethu Madhava. There are additional shrines and small temples for Ganesh, Murugan, etc. within the temple complex. Performing this bathing and puja gives us immense spiritual merit and is the height of our visit to Ramesvaram. I felt very good upon doing this. Thereafter, we can continue to wander the halls of the temple for a while if we want to see whatever else there is to view, and there is, indeed, still more. The original shrine that housed the lingams many years ago was but a simple thatched shed. But the temple as we see it today was begun in the 12th century and expanded over the centuries by the rulers of the area. Only Hindus or those of us willing to bathe in the 22 wells are allowed into the inner sanctum, but fortunately while I was there, they also brought some of the deities out of the temple on palanquins for a little parade through the streets around the temple in the evening to celebrate one of the festivals. That enabled me to see them quite clearly in the daylight as well as take photos of them. Ramesvaram has plenty of places to see in relation to Lord Rama and the Ramayana. Our next visit at Ramesvaram is to see Dhanuskodi, which is the long peninsula that extends into the sea. There’s not much to see here but the small fishing village where the curious children follow you asking for rupees. But three kilometers further out on this thin stretch of sand is the confluence of the Bay of Bengal and the Indian Ocean that is considered to be Sethu Bhandan. This is said to be where Lord Rama and His devotees built the bridge from floating stones that reached Lanka in order to rescue Sita, as fully described in the Ramayana. At the request of Vibhishan, after having used the bridge, Rama broke it with the end of his bow, causing it to sink. Hence the name Dhanuskodi, which means “bow end.” Some people say that the many rocks below the surface of the sea that leads out to Sri Lanka is evidence that such a bridge actually existed. It is at the tip of Dhanuskodi where sincere pilgrims bathe either before or after their pilgrimage to the Ramesvaram temple. And a pilgrimage to Ramesvaram is recommended before one makes a pilgrimage to Varanasi in the eastern part of India. It is said that by taking a holy bath in the ocean waters at Dhanuskodi one gets all the fruitive results of performing the agnistoma ritual, and simply by visiting Dhanuskodi one is liberated from the cycle of repeated birth and death. So, this area has many important historical connections dating back to the time of Lord Ramachandra as related in the Ramayana. So, once we arrive at the fishing village, we get a ride in a truck with other pilgrims out to the sea. While there we walk over the sand to the water where we take a little holy bath in the sea for further freedom from past karma. However, you cannot see Sri Lanka from here, but it is just over the horizon. Heading back from the fishing village, and five miles east of Ramesvaram, is the Kothandaraman temple. It is said that Vibhishana, Ravana’s brother, surrendered to Lord Rama at this place. We make a short stop here to get darshan of the deities of Lord Rama and Vibhishana and then go to see other points of interest. About a mile and a half north of the temple is Gandhamadana Parvatham, a temple that houses the footprints of Lord Rama. It is on a hilltop from where Hanuman is believed to have leapt across the sea to Lanka. It is also from this spot that Lord Rama looked out to see where the closest place was to Sri Lanka to start building the bridge. From the top of the temple one can get a beautiful view of the town. Just at the base of the hill is a small Hanuman temple that marks where Lord Rama gave His ring to Hanuman when he was to jump over the water in order to find Sita. It was this ring which he gave to Sita to prove that he was a friend of Lord Rama. About eight kilometers west of town is Valundi Thirtam. This is where Rama and Sita got fresh water after Rama rescued Sita. Rama made a well here by shooting His arrow into the ground when Sita was thirsty and requested water to drink. There used to be a narrow and deteriorating bridge that takes you over the sea waves out about 30 yards to the well that is located in the salty water, the walls of which still stick out above the sea. But now the little bridge it has been renovated and is a much better structure than before. Jata Thirtam, two and a quarter miles or eight kilometers east from Ramesvaram, in a forest off the road that leads to Dhanuskodi, is a place glorified in Chapter 20 of the Sanat Kumara Samhita of the Skanda Purana. This place is said to be where Lord Rama first took His bath after killing Ravana and before worshiping the Ramanatha lingam. This place is also called Sidai Thirtam or Jatayu Thirtam and is where Jatayu fell after his wings had been cut by Ravana. If we have time and interest, after we leave the Ramesvaram temple from the west entrance, we can walk 25 minutes north along the road to a small Kali temple. This is maintained by a family who takes pride in their duties of devotion to the Goddess and are glad to have visitors. Ten miles northeast of Ramesvaram is the coastal village of Devipatnam or Navapashanam. Here is a temple to the nine planets, said to have been originally installed by Lord Rama for worship. The nine stone columns in the sea are said to be all that is left of the original temple, which indicates that sea levels have risen since that time. Sixty kilometers from the Ramanathaswamy temple is a Vishnu temple known as Thiruppullani or Darbhasayanam. This marks the place where Lord Rama lay on a bed of Darbha grass before proceeding to Lanka. Inside are deities of Sri Rama lying on His grass bed. In this way, there are many points of interest that are connected to the pastimes and history of Lord Rama in Ramesvaram and the surrounding area, and it is nice to relax and set a daily itinerary of the places you want to see. As with any holy place, at least in my experience, the longer you stay, and the more sincere you are, the more that becomes revealed. This is how we can remember Lord Rama and actually see the places that are still connected with Him in His pastimes of the Ramayana as found in Ramesvaram. Jai Sri Sri Sita-Rama.